Sixpence For Your Shoe: Sprinkles Delivered! It's true, everyone loves a cupcake. Fun to eat, fun to look at; the perfect proportion of cake and frosting. 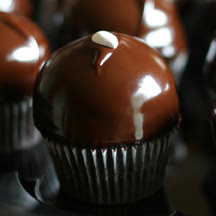 So, imagine my pure glee to sample one this weekend from the fabulous cupcake delivery service Cupcakes Gourmet. We send flowers, fruit and cookies, but cupcakes??? Genius! But the fun doesn't stop there! 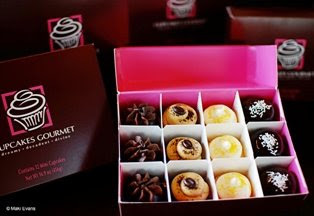 Cupcakes Gourmet also specializes in weddings and special events. Regular cupcakes are $3.50-$5.00 each and mini cupcakes are $1.50-$3.00 each, before set-up and delivery. I know the obvious idea is to use cupcakes in lieu of a wedding cake, but my favorite idea is to wrap the minis individually as favors!!! This is making my mouth water. Peanut butter cupcakes??? YUM. i am waiting for my box to be delivered ....... i mean from you ! WOW!!! I was like Pavlov's dog right now.... my mouth is puckering up for those tasty treats.